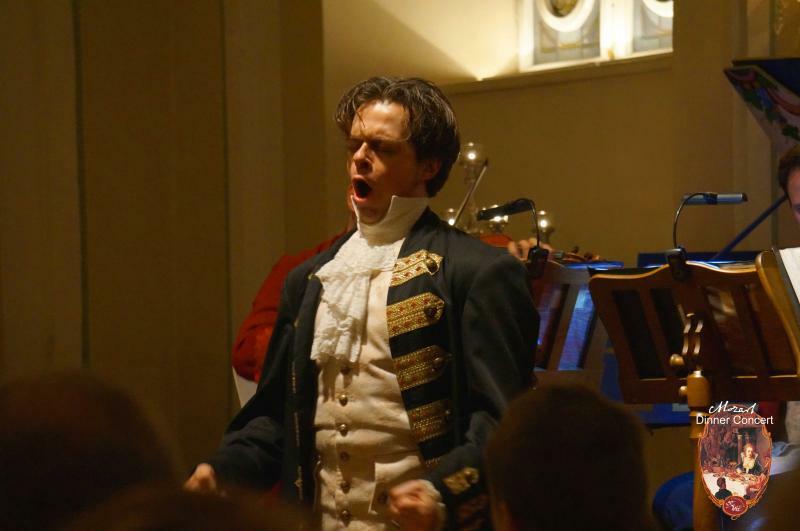 Mozart Dinner Concert is unique in Salzburg. And this music is most important to us. The Mozart Dinner Concert takes place nearly every evening. 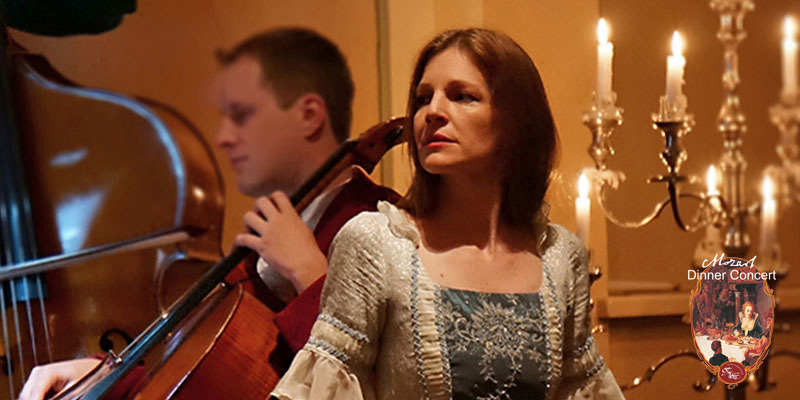 Singers and strings of the "Amadeus Consort Salzburg" perform arias and duettos from “Don Giovanni“, “Le Nozze di Figaro“ and “The Magic Flute“ as well as instrumental works like the serenade “A little night music“. You will enjoy a lively and scenic performance. The Dinner is served during concert breaks. THE BAROQUE HALL is a part of Stiftskeller St. Peter, first mentioned in 803 and famous for being the oldest restaurant in Europe. In 1789 at St. Peter church Mozart’s c-minor mass was first performed. Moreover the Mozart family used to dine at St. Peter. In 1783 "Nannerl" Mozart wrote in her diary: "...had lunch at St. Peter…made music". THE DINNER is carefully prepared according to recipes of the 18th century. We serve white Cream Soup with rosemary-quark-dumpling, Breast of roasted capon on top of portwineglace with potatoe-pumpkin dumpling, semolina strudel and vegetables (sometimes from Pater Prior´s garden). The dee is a Semi-frozen parfait of honey. ... make uncountable references to culinary delights. Good reason for us to marry his divine music with our dinner by candlelight and to stage it in a spell binding historic ambiance. The single courses of our dinner are served during the concert intermissions. On request we serve a vegetarian or gluten-free dinner. Mozart Dinner exclusive ... € 89,00 - includes also a starter, a programme booklet and a separate table for two, four or six persons in the front. 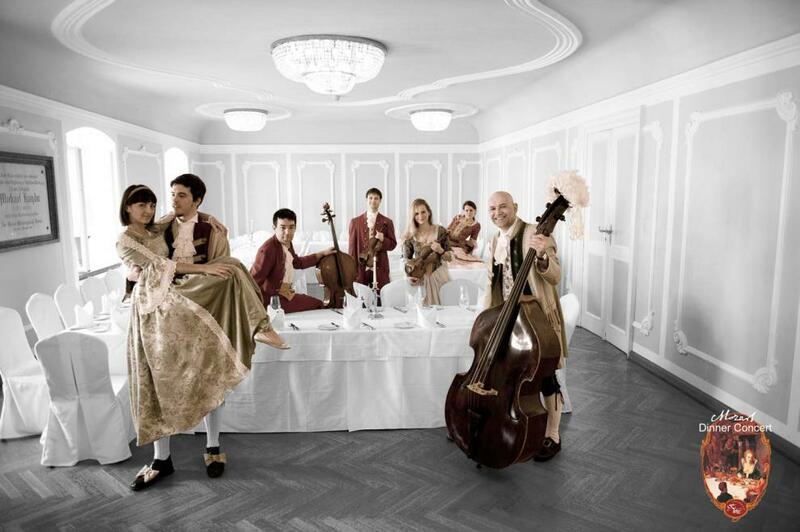 Enjoy a unique New Year´s night with arias and duets from the "Magic Flute", "Don Giovanni" and "Le Nozze di Figaro" with our Amadeus Consort Salzburg consisting of 5 strings and 3 singers in period costumes. In the intermissions we are serving the delicious New Year menu. The prices include the menu, the concert, as well as your personal reservation. The allocation of places according to the entrance of the reservation. Please note that the restaurant St. Peter on new year's Eve, increased drink prices apply and no open beverages are served. The event ends at about 23.30 h.
Of course, you can spend the new year in the Baroque Hall, but feel free. It is the full beverage service available. 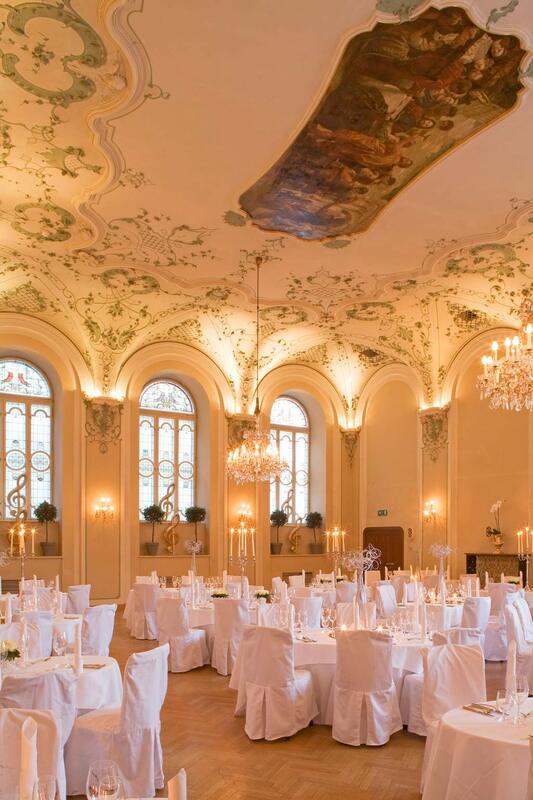 The MOZART DINNER CONCERT takes place in a unique, historic atmosphere. The Baroquehall of Stiftskeller St. Peter is part of the famous Benedictine monastery and is situated in the oldest part of Salzburg. It was first mentioned in 803 on occasion of Charlemagne´s visit. Even the Mozart family had dinner there. "Nannerl" Mozart wrote in her diary in october 1783: “papa and henry had lunch at st peter... made music ... rained heavily“. In 1789 in the church of St. Peter monastery Mozart´s c-minor-mass (KV 427) was performed for the first time, Constanze Mozart sang one of the sopran solo parts. The composer Michael Haydn, a good friend of Mozart, lived and made music in the "Haydn Room". Our musicians like to spend their breaks there when dinner is served in the Baroquehall. On request there we also organize exclusive MOZART DINNER CONCERTs for private parties up to 80 guest. 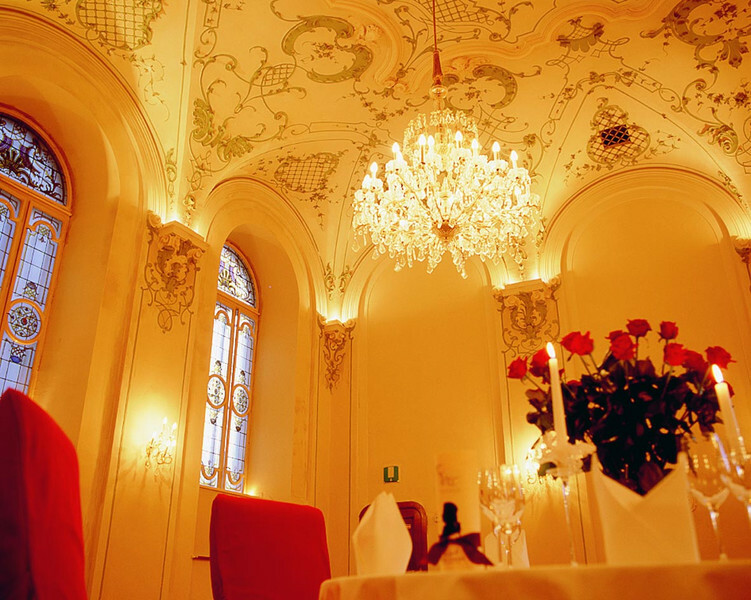 In this unique ambiance the Mozart Dinner Concert takes place. Distances are short in Salzburg. 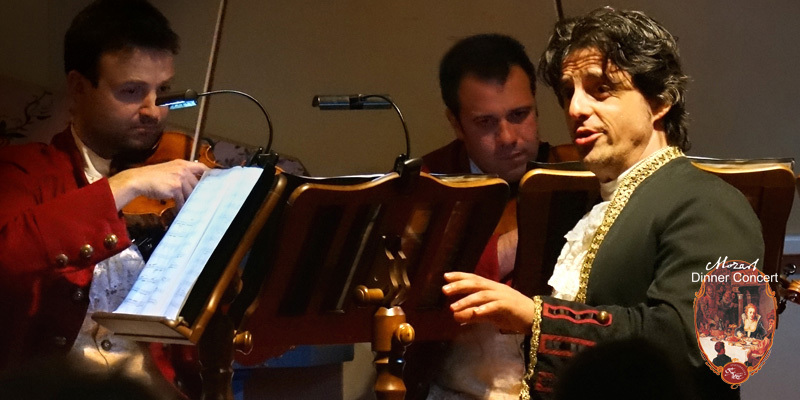 From almost everywhere in old town you can reach Mozart Dinner Concert on foot in a few minutes. Taxis are allowed to drive into the old town, so they are able to take you to the vehicle-free zone of St. Peter’s inner courtyard. We recommend taxi service 8111 by calling the telephone number 0043 662 8111. Riding in a carriage is also possible. We will be pleased to assist you, so feel free to get in touch with us. Private cars aren’t allowed to drive into the inner old town (pedestrian zone). The easiest way to park is the parking garage “Mönchsberg”, which is nearest to St. Peter.